Will It Be Bailout Or Bailin? Zero Hedge: "It is so critical for Angela Merkel to halt the plunging stock price, an indicator DB's retail clients, simplistically (and not erroneously) now equate with the bank's viability, and the lower the price drops, the faster they will pull their deposits, the quicker DB's liquidity hits zero, the faster the self-fulfilling prophecy of Deutsche Bank's death is confirmed. Which ultimately means that DB really has four options: raise capital, approach the ECB for a liquidity bridge (this may also backfire as counterparties scramble to flee a central bank-backstopped institution), appeal for a state bailout (Merkel has so far said "Nein") or implement a bail-in, eliminating billions in unsecured claims (and deposits) and leading to a full-blown systemic bank run as depositors everywhere rush to withdraw their savings, leading to a collapse of the fractional reserve banking mode (in which there is only 10 cents in physical deliverable cash for every dollar in depositor claims). Which of the four choices Deutsche Bank will pick should become clear in the coming days. Until it does, it will keep the market on edge and quite volatile, because as Jeff Gundlach explained today, a 'do nothing' scenario is no longer an option for CEO John Cryan as the market will keep pushing the price of DB lower until it either fails, or is bailed out." Martin Armstrong: "With over $60 trillion derivative book at the Deutsche Bank, the government is totally incapable of even understanding how to deal with this crisis. We are looking at a major crisis in confidence. Merkel is simply out of her mind to adhere to this insane policy of a bail-in. How can hedge funds stay with clearing at Deutsche Bank when she takes this position that would set off a catastrophic global meltdown. It still appears that Merkel will have to blink. Once people realize this is the real crisis, then the German debt market should turn down rather hard. The pressure is clearly building based upon how my own phone is melting down. 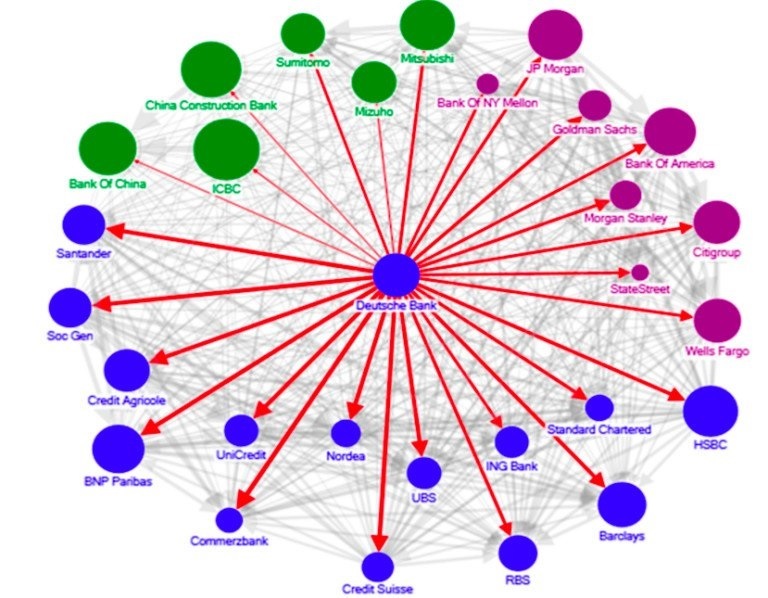 This illustration based upon IMF data, illustrates the global contagion. I “BELIEVE” that Merkel will be compelled to blink. We may see an announcement this weekend at the latest where she must address this issue. The implications of a global contagion go far beyond Germany."